Henselite are proud to support the Scotland Deaf Squad. 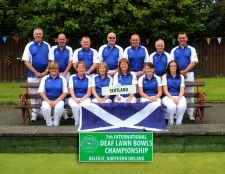 Who are currently participating in the Deaf Lawn Bowls Championship in Belfast, Northern Ireland. Belmont Bowling Club is hosting this event which features male and female competitors in singles, pairs, triples and fours matches. The 7th International Deaf Lawn Bowling Championships are taking place in Belfast for the first time. This prestigious competition brings together over 100 elite deaf bowlers from all over the world including players from as far afield as Australia and New Zealand. The opening ceremony took place at 10am on Sunday 30 August at Belmont Bowling Club and the competition continues until Tuesday 8 September. Admission is free and all supporters are welcome to attend an exciting ten days of top sporting action. Good luck to all bowlers who are participating in the 7th International Championships! !